David Murray writes in the Foreword: 'The minister's soul is the soul of his ministry.' I can't remember where I first heard this saying, but I've never been able to forget it. And, having read this book, I never want to forget it. In these pages, Jim Savastio and Brian Croft establish the foundation of all faithful and fruitful ministry-the pastor's soul. But, although their main target is the epidemic of ministerial hyper-activity and the accompanying burnout, backsliding, and brokenness, they carefully avoid over-reacting and running to the opposite extremes of monkish withdrawal or lazy self-indulgence. Instead, you have a book that skillfully walks a balanced biblical path in both content and style.It balances self and others. Yes, the pastor is all about serving others, about sacrificing for the sake of others, about spending and being spent for others, and about pouring out themselves to fill others. But, as many pastors have discovered to their cost and pain, servants are finite, sacrifices eventually turn to ashes, non-stop spending leads to bankruptcy, and pouring out without ever filling up ends in drought. This book reminds us that caring for self is not selfish but necessary if we are to sustain a life of caring service to others. It's not a warrant for sloth or selfishness, but rather a call to self-care that will lead to better other-care. 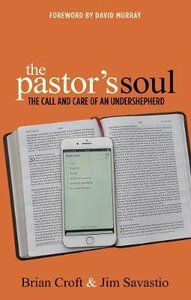 About "The Pastor's Soul: The Call and Care of An Undershepherd"
Brian Croft graduated from Indiana University in 1997 with a BA in Sociology and did some graduate work at The Southern Baptist Theological Seminary. He has served in pastoral ministry in some manner for over 12 years and is currently in his 5th year as Senior Pastor of Auburndale Baptist Church in Louisville, Kentucky, USA. He and his wife, Cara, have 4 children: Samuel, Abby, Isabelle and Claire. His hobbies include sports (golf, tennis, racketball), playing music (piano and guitar), reading (especially biographies and American history), teaching self-defense classes and teaching his children sports and music. Jim Savastio has been one of the pastors of The Reformed Baptist Church of Louisville, KY since 1991. He is also the President of the Board of Directors at Practical Shepherding. He is married to Becky and they have four children.